UAE provides several opportunities and incentives for investors, entrepreneurs and jobseekers from all parts of world. It is the reason that investors and jobseekers prefer UAE over most of other countries in this region. But this situation also creates problems for government and people of UAE. Sometimes, people from various countries try to get these better job opportunities illegally. Recently, UAE announced amnesty for such people that enter the country illegally in order to get better jobs. Now, the government of UAE has decided to curb this situation forever. For this purpose, UAE is going to introduce new strict laws for citizens of selected countries. 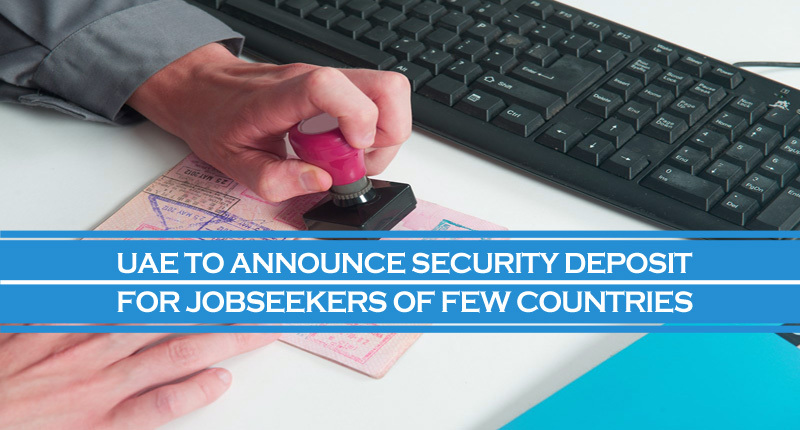 According to latest orders by the Federal Authority for Identity & Citizenship, jobseekers from various countries will be required to pay security deposit. Only after that, they will be issued tourist and visit visas. So far, these orders haven’t been introduced and there is consideration on its proposal. The reason for consideration of such strict rules is latest findings of authority that most of these illegal residents entered the country on tourist or visit visa. Authorities are expecting that these tougher rules will help them to reduce number of illegal residents in the country. In another step, the authority has also announced to issue a six-month visit visa for jobseekers. This visa offer will start after the end of current amnesty scheme. The purpose of this initiative is to make this process attractive for masses. It will also increase number of people to use legal ways to enter the country and find job of their choice. Among other changes introduced for job visa rules, if jobseekers want to work in the country but have overstayed their visas, then they will be granted six-month visa to find job. Foreigners will not be required to leave and re-enter the city to adjust or renew their visa. They can do so without paying fee. Now, embassies are also allowed to bear cost of air tickets of their citizens that overstay in the country. Apart from that, punishments like deportation, fines and jail have also been imposed for those violating residency laws after the end of recent amnesty scheme. AED 50,000 fine for each worker will be applied on people or companies caught for hiring illegal residents. These recent announcements and considerations clearly reveal the strictness as well as seriousness of the government of UAE to legalize job seeking process for foreigners. Therefore, it is important to take this matter seriously and contact a reputed consultancy firm to get complete information and assistance for this purpose. We at Riz & Mona Consultancy can provide complete legal and employment assistance to all such foreigners who want to work in UAE.